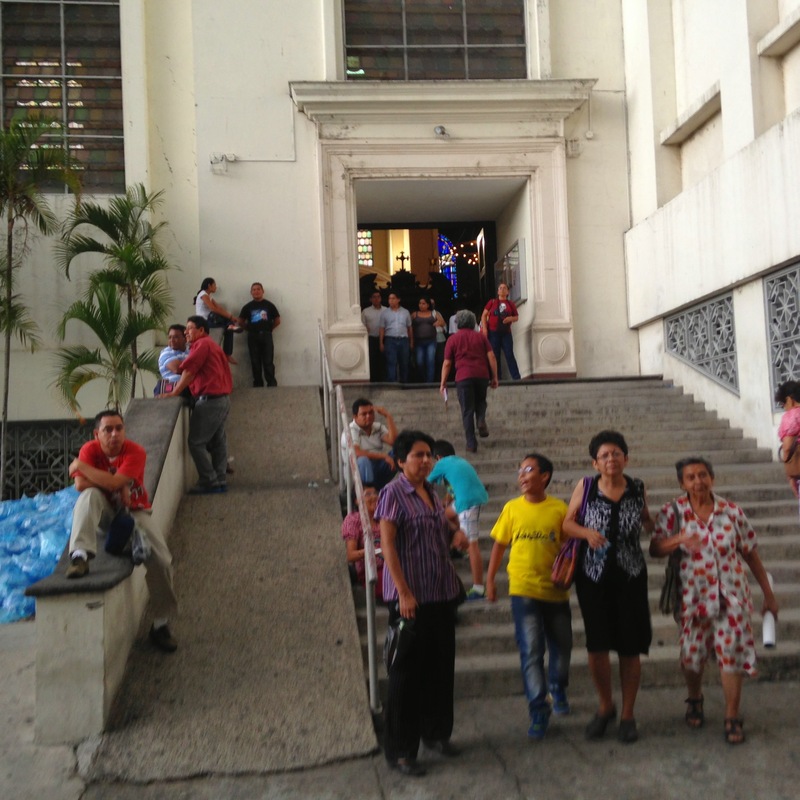 A divided Salvadoran church—can it stand? 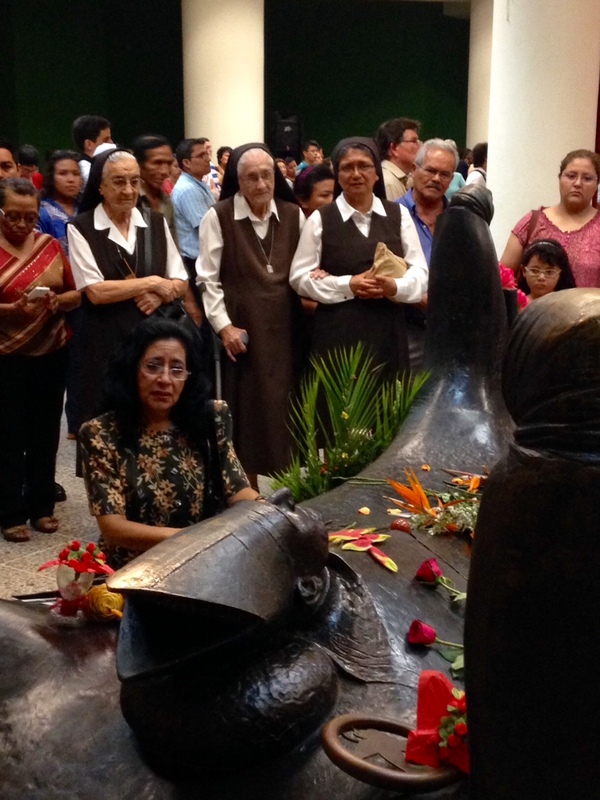 “Sshh, it’s not here,” is what a Franciscan sister quietly said to her two guests upon walking into the cathedral in San Salvador on Friday, May 22nd, the day before Romero’s beatification. After a couple of minutes in the cathedral, the three of them walked out through the same side entrance that had incorrectly led them upstairs into the cathedral instead of downstairs to the basement they were seeking. This common mistake, that Romero would be located in the cathedral instead of the basement, is repeated time and again by visitors. For decades now, the cathedral church has not had any permanent reference to Romero. 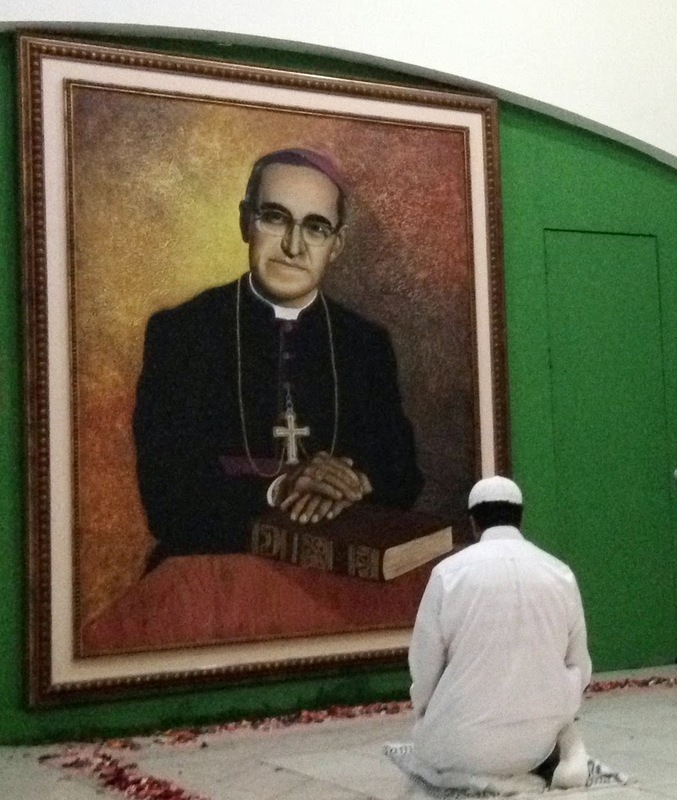 Visitors search in vain for icons, statues, photographs, or anything else that may associate this worship space with its former archbishop—blessed Oscar Romero. The only image one finds there, in addition to the sacred heart of Jesus, is that of the founder of Opus Dei—Josemaría Escrivá. This image of Escrivá was placed on the right transept where the tomb of Romero once stood. I visited the cathedral again on Pentecost Sunday, the day after the beatification, and now the cathedral had two items referencing Romero—the official relic (his clergy shirt) of the beatification, located on the right side of the altar, and a painting of him located on the left side of the altar. The bloodstained clergy shirt will journey through the various dioceses of the country and throughout Latin America, but it is not clear whether it will return to the Cathedral for permanent display. I stayed in the cathedral for about fifteen minutes while mass was taking place, perplexed that at most only a quarter of the seats were filed. I walked out disappointed at the emptiness of the cathedral space. Desiring to visit Romero’s tomb one more time, I walked out the side door, descended the stairs to the parking lot, and then descended the stairs to the basement of the cathedral where his tomb lies. As I walked down the thirty or so steps, incense filled my nostrils, guitar music filled my ears, and an oppressive heat forced my body to begin perspiring. 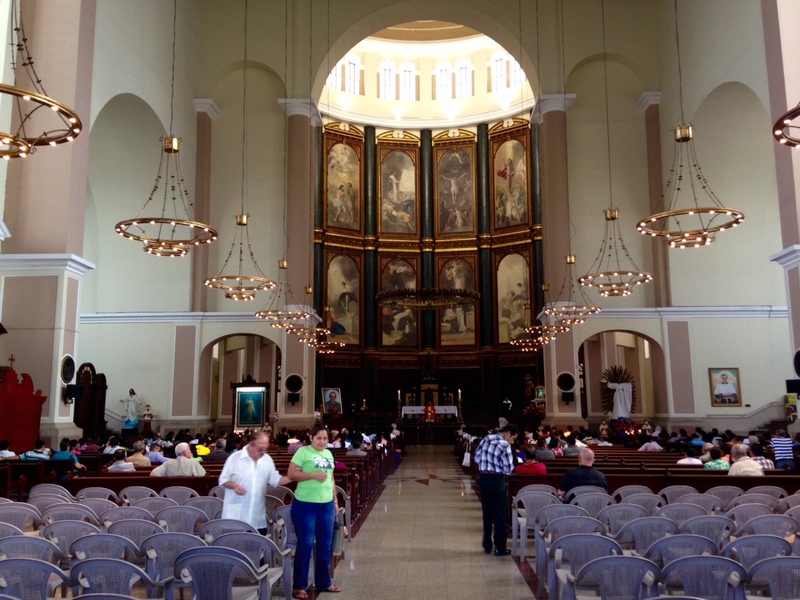 In a large open space with no windows or fresh air, hundreds of people stood side-by-side occupying every seat and aisle in order to participate in the 10 am liturgy that has been celebrated there for the past fifteen years. A community of mostly laypersons associated with Christian Base Communities passionately keeps alive Romero’s memory in the crypt. While various priests from different countries presided over the liturgy, people came and went from Romero’s tomb, leaving behind their tears of sorrow. This underground church embodies a holy cacophony, where emotions are laid bare, where prayers are of life and death, where mass songs are the same one’s sung during the war, where the faithful clamor for justice and peace, and where women and men of all nationalities and religious traditions congregate to pray in their respective ways. Whether we call it the basement, crypt, catacombs, or simply the underground church, it is clear that within the single structure of the cathedral exist two very different churches—one that continues to proclaim the life and death of the prophet who spoke against the repression of the government, and one that as of Saturday’s beatification has claimed (perhaps temporarily) the image and priestly shirt of Romero. 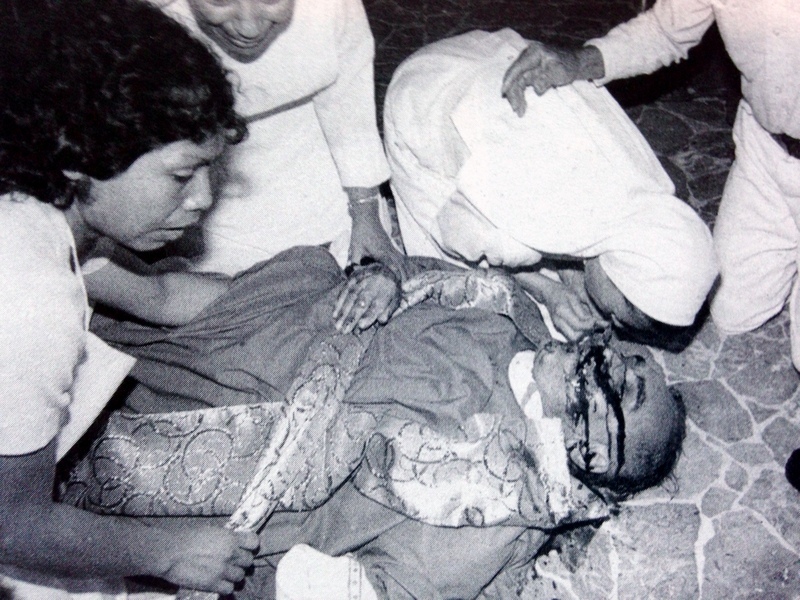 The symbol of the clergy shirt that was strategically chosen to represent blessed Romero must not be divorced from the body that wore that shirt, that sweated from tireless active commitment, and which violently bled upon it because of his prophetic preaching. Let us not forget that Romero was a priest and a prophet, an announcer of the gospel and a denouncer of injustice, a spiritual leader and a tireless worker who everyday went to prisons to seek the liberty and liberation of those unfairly condemned as dangerous because of their pastoral work. Romero the priest and Romero the prophet cannot be separated. The official cathedral church above, and the marginalized underground church below are a symbol of the division that marks the Salvadoran church. Will we see the day when the vibrant passion of the underground church enlivens the official cathedral church? Will we see the day when visitors can walk into the main cathedral and immediately know that this is the same space from which Romero preached his fiery yet tender sermons? Or will the divisions only deepen and further create two churches, one marked by the disrespectfully appropriated clergy shirt, and the other by the assassinated body that resides in the basement? Romero’s body has been moved three times within the cathedral structure—perhaps a fourth move will take place one day, which will restore Romero to the cathedral space he knew so well. Or perhaps Romero will continue to exist on the margins of the cathedral, flaming the underground fire of justice and comforting those who come bearing their soul. Regardless of where his body and clergy shirt ultimately reside, and the type of church that they ultimately come to symbolize, let us not forget that they were once together, and that as one they were pierced by the same bullet shot from the same rifle out of hatred for his message of good news to the poor. Romero is officially a blessed, and soon he will most likely be canonized a saint. As he moves deeper into the canon of holy men and women, will his historically grounded struggle for peace and justice be spiritualized and made palatable for official cathedral spaces? Will the priestly collar of the shirt eventually overshadow the prophetic blood shed upon the shirt and vestments? Is this perhaps the only way Romero will be allowed into his own cathedral? 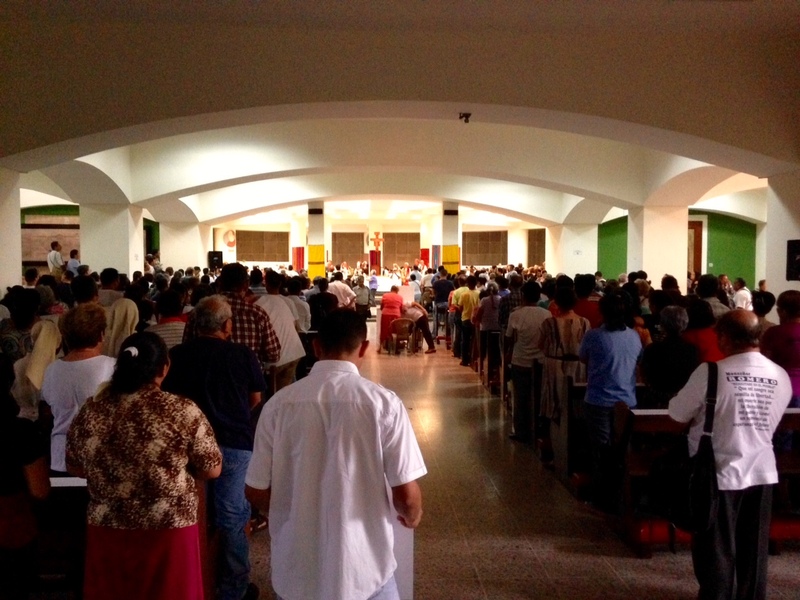 At what cost can the Salvadoran church have unity, and at what cost division? A house divided—can it stand?